Summer means squash. LOTS of squash. There are only so many things you can do with squash… so I’m always looking for new recipes that offer something a little different. 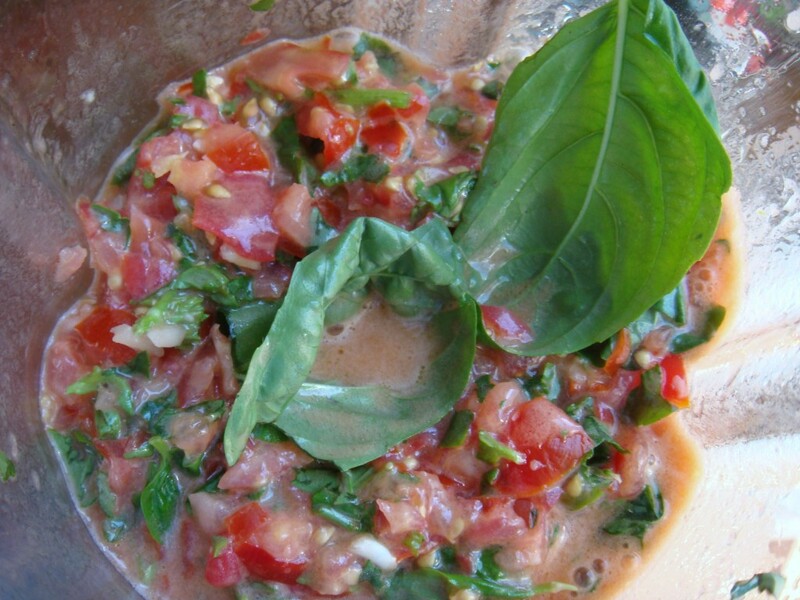 One of my favorite sites to peruse for new recipes is www.foodgawker.com. It’s addtictive. This week’s CSA bounty included about 10 baby zucchini (1.25 lbs), and I needed to make sure they didn’t go to waste. So, I decided that I would do somethig with them THAT night… and then I remembered an interesting recipe I saw on another food blog (thanks to Foodgawker, of course). Put first four ingrediets into the blender. Process until liquified. While running, slowly add the oil until fully emulsified. Add salt and pepper to taste. Salt really brings out the taste of the tomatoes, so I suggest adding at least a little, even if you’re not a big salt fan. Once fully blended. 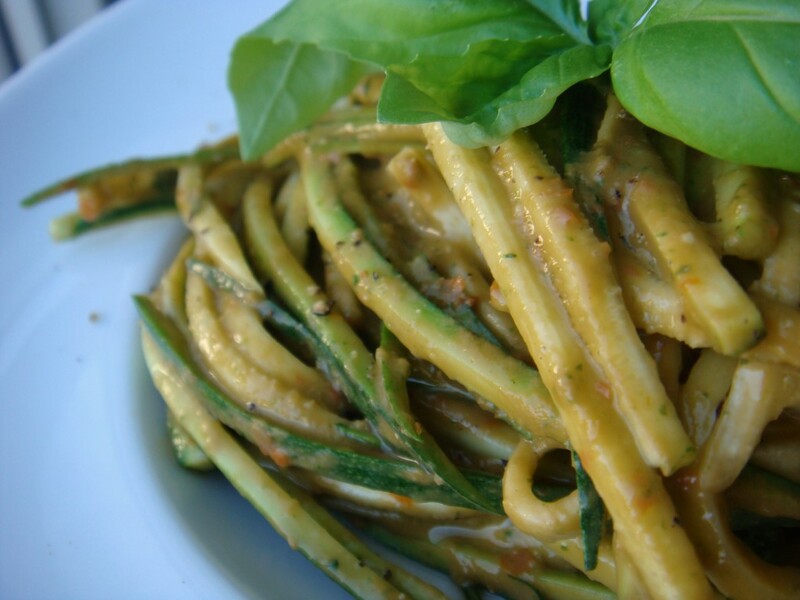 Toss the sauce with zucchini “noodles”. You can top the dish with a sprig of fresh basil, some shredded parmesan cheese (then it would no longer be vegan) or some pine nuts. Raw, not roasted, if you want to keep this dish “raw”. 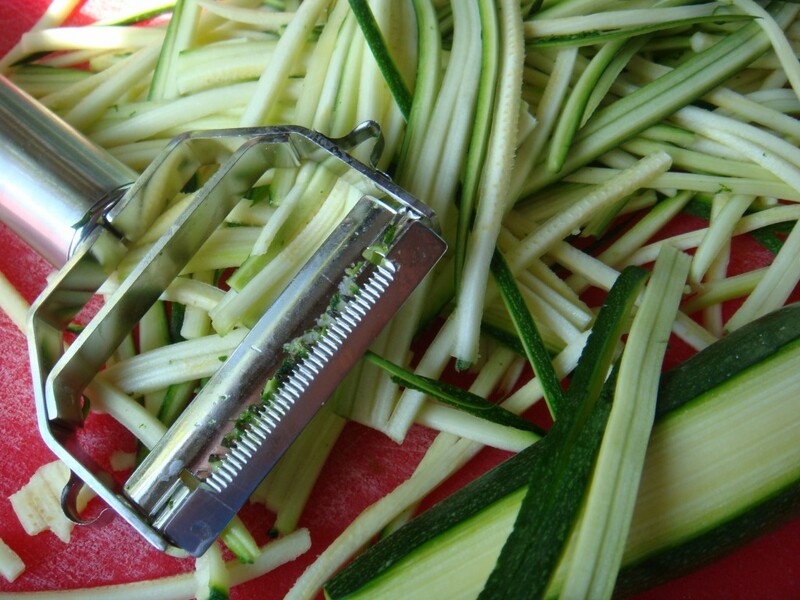 For my zucchini, I used a special vegetable peeler I have that actually shreds the squash into long threads. It was a bit time consuming and sort of a pain, but it came out looking perfect! I didn’t measure my tomatoes, I just used what I had. I also threw in the entire bunch of basil I got from the CSA share. I’m guesstimating it was about a cup. Mabye a bit more. I added a fair amount of salt… probably about a good tablespoon, maybe a bit more and used Fleur de Sel — it tends to be a bit lighter and is also flakier, so I figured it would dissolve better. Once I added the salt and fresh-ground pepper, I continued blending the sauce until it was nice and thick. The final result really LOOKED like pasta. The sauce clung nicely to the zucchini strips and it smelled SOOOO good. The taste was delicious. This is definitely a keeper and was a big hit with D. I couldn’t get a enough of it… so I had to watch myself, as this is not a low-cal dinner (1/2 c oil, remember?). I had a fair amount of sauce left over though. There was too much for the amount of zucchini. I need to mess around with the recipe a little to get the amounts worked out better. 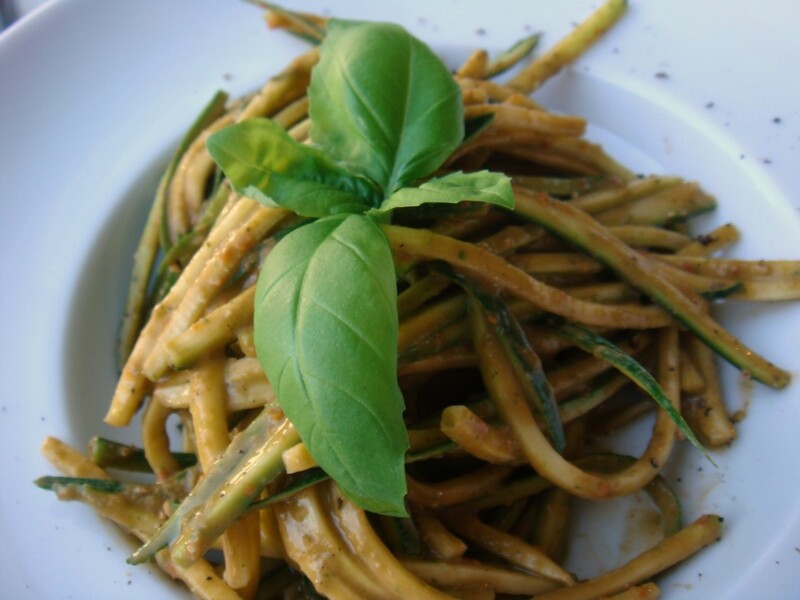 This dish is super fresh, healthy, delicious and very easy to make (aside from slicing the zucchini). I definitely do not reccomend making this in advance OR letting it sit over night. The sauce will separate and the zucchini will lose it’s water and you’ll wind up with a very runny dish! Lastly, if you’re thinking about venturing into the raw world or just want to try a few things out, I made this Raw “Cream” of Asparagus Soup last year and it’s AMAZING. I definitely suggest giving it a try!